Sometimes artist just have to have a little fun and Halloween is the perfest time to play.I'm not sure what kind of Treats this guy is looking for but I'm sure he knows how to show a girl a good time. 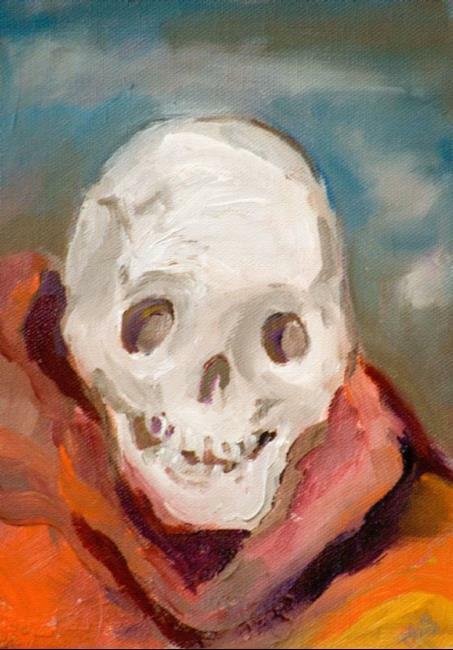 Description of artwork TITLE: Trick-Or-Treat Skeleton This work has been clear coated to protect your investment Style: Whimsical Size: 8x6 Colors: red,gray.orange Medium: oil Support: oil on canvas mounted on hardboard Shipping: -USPS Priority Ready to Frame: Signature: Always Signed . This Painting can be purchased at my blog http://paintingoftheday.blogspot.